It's not nice to laugh at foreigners' mistakes when they are trying to communicate in English. So I'm not laughing here. Rather, I am utterly bewildered at this menu I saw outside a restaurant in Corsica. There is a certain charm and delight in the mistranslation of ou (or) as "where" (French: où). 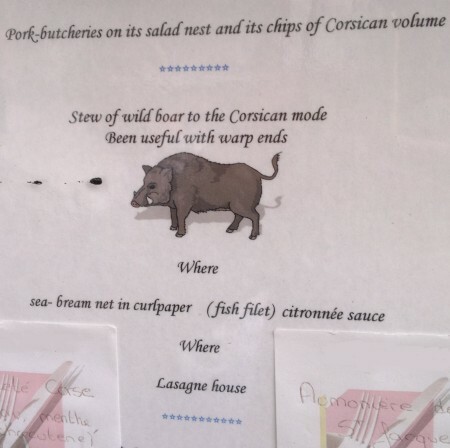 The starter's chips of Corsican volume sound interesting too. But the wild boar stew "been useful with warp ends" is something to be treasured. They meant "served with penne pasta" ... I think.